The Oil States SureLock diverless end connector is designed to allow pipeline operators the ability to repair damaged pipelines in extreme water depths beyond conventional manned diving operations. The connector is designed for in-line repairs, eliminating the need for costly U-shaped type jumper connectors. The SureLock connector utilizes proven technologies such as dual-barrier Viton sealing, structural attachment collet gripping system and the ability to verify sealing via annulus testing port. A vertically positioned running tool actuates the seals and grips simultaneously to increase the efficiency of the repair operation. The running tool is then retrieved for other projects and has interchangeability on the Oil States Diverless Repair Clamp. In-line repair connector eliminates costly jumper fabrication. 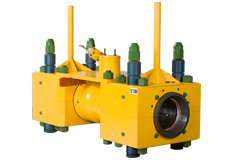 Utilizes collet gripping system to structurally attach to the pipeline. Dual-barrier Viton sealing system inboard of the collet to reduce the pressure envelope. Onboard annulus testing system to verify seal integrity. Retrievable running tool that sets seals and grip simultaneously.